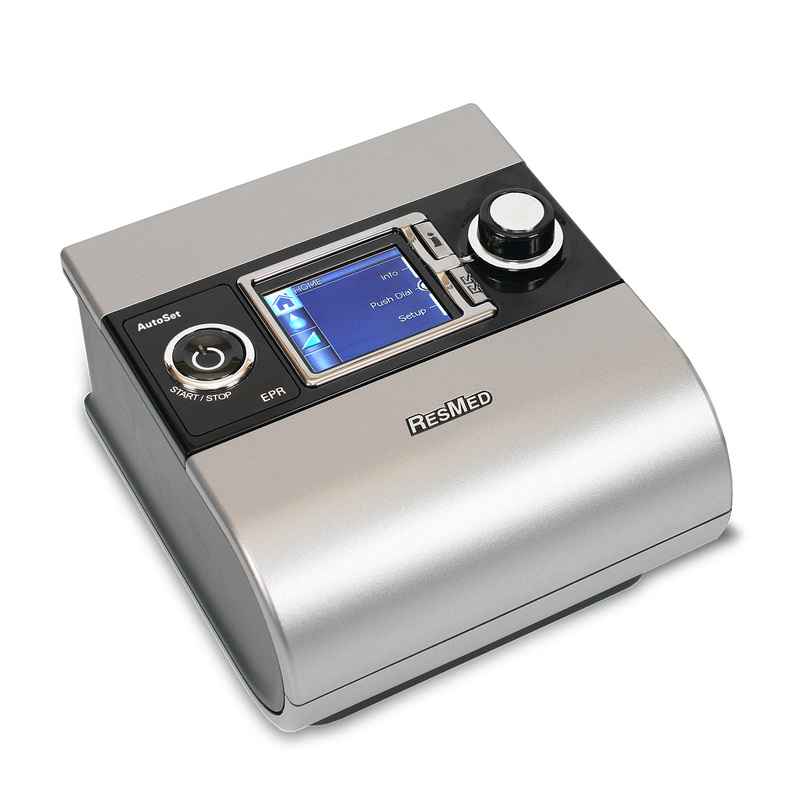 The S9 AutoSet series of Automatic Positive Airway Pressure (APAP) machines have long been designed to maximize comfort while providing minimal therapy pressures at the optimal moment. ResMed builds upon the AutoSet Advantage algorithm and incorporates EPR with Easy-Breathe technology in a new post modern shell. Please visit the S9 AutoSet with H5i and ClimateLine Tubing product bundle to take full advantage of Climate Control Technology. ResMed has incorporated a simple and effective tool for help with proper mask fitting. The Mask-Fit system allows users to preset a mask type, tailoring the S9 CPAP therapy to a particular mask style: (Nasal, Pillows, Full Face) Once set, the Mask-Fit system runs a 3 minute seal integrity test, prior to therapy treatment. After 3 minutes, a Mask-Fit icon appears (a green or red smiley face). If the smiley face is red, adjustments are necessary until the smiley face turns green, then therapy will begin. The S9 Series CPAP machines come standard with the ResMed SlimLine Tubing. The small diameter air tube is ultra-light, flexible and provides a unique alternative to bulky, generic 6 foot hoses. If you already own a tube wrap, ResMed also offers a Standard Hose. The (Optional) ClimateLine Tubing has an internal heated coil and mask temperature sensor that helps manage rainout throughout the hose. Climate Control algorithms measure temperatures inside and outside to help prevent condensation from forming inside the tube. The heated tubing has a built-in mask temperature sensor to detect relative humidity at the mask. The (Optional) ClimateLine Tubing can also use the SlimLine Tubing Wrap to achieve total control of rainout. ResMed's AutoSet Advantage is the answer to providing 'just what you need, when you need it'. Pressure needs vary throughout the night. These variations depend on how deep the user is sleeping, body position, and other daily factors that can affect therapy levels. AutoSet Advantage effectively minimizes therapy and helps lower pressure-related side effects, like mouth-breathing and nasal dryness. The AutoSet Advantage has always provided a strong defense against a main types of sleeping events: (Flow Limitations, Snoring, Obstructive Apneas) The Enhanced AutoSet Advantage now detects and responds to open events using an event responsive Forced Oscillation Technique (FOT). A different event response is generated when an open airway event is encountered. The S9 AutoSet uses Easy-Breathe Technology along with expiratory pressure relief (EPR) to make breathing through an APAP feel natural. At the onset of a flow limitation, the AutoSet algorithm responds with an increase of therapy pressure based on the degree of airflow restriction. Easy-Breathe technology aids in smoothing the pressure waveform during pressure increase. The process imitates normal respiration and ultimately makes breathing more comfortable than traditional CPAP machines. Easy-Breathe allows the user to receive the lowest pressure necessary to keep the airway open. As an added benefit, Easy-Breathe allows the S9 Series to operate at 24dBA when set to 10cm of pressure from a distance of one meter. ResMed also managed to reduce the overall conducted noise that typically travels from the machine, through the tubing, and at the mask. DC Power Only use DC Converter by ResMed for DC input or damage may occur.